We have been home a week from vacation, it feels now like we never went. Isn't that weird how that happens? It all seems like a blurr. 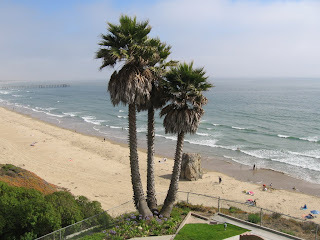 This year as a family, we went back to our favorite family vacation spot, Pismo Beach, located on the Central Coast of California. There were ten of us..my husband and me, our daughter, son in law and my youngest and oldest grand girlies, our son and daughter in law and my two middle grand girlies. Oh, and Molly, our son's family's chocolate lab puppy. I was weary and tired as our vacation time approached. It had been a busy year and especially the last few months with health issues and busyness in our Women's Ministry at church. Busier actually, than I had been in years. 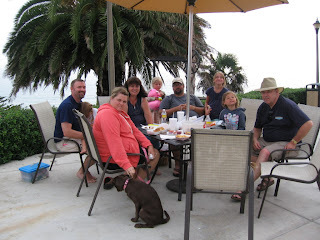 I was so looking forward to relaxing and all of us being together making new memories. I had to make trip to urgent care two nights before we left with an ear infection. It seems every time we go away together I get sick..so I was a little discouraged. I have learned to roll with the punches but I was blind sighted the first day we arrived when my foot froze up and I could barely put any weight on it. This happens periodically, but it hadn't happened for awhile. The drive takes 4-5 hours depending what the traffic is like in Los Angeles. On the drive up to Pismo, I said to my husband, " I have an assignment for us while we are gone. Let's look for glimpses of God's glory this week." So we talked a little bit about it and several times during the first day my husband asked, "Any glimpses?" I would just smile... not yet. 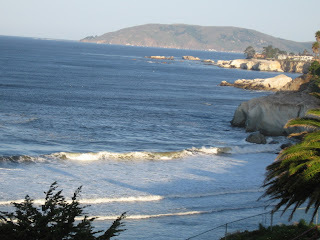 Here I was at a beautiful stretch of California coastline.....I saw dolphins, sea lions and I think I spotted a whale one day...reflections of the sun through evening fog coming in...rolling hills of Vineyards...the majesty of my Creator was all around me. Nothing wowed me as a glimpse of His glory. I guess what I wanted was....Oh my goodness, would you look at that! I would sit on the balcony of our room looking out over the ocean..just saying to God, " Show me Yourself in a special way." Here I was soaking in all the beauty and fresh air and yet I didn't feel I'd seen anything I was looking for. I have never been one to look for the big hype or emotionalism of Christianity and I still wasn't. The night before we were to head for home our son's car wouldn't start and he had to be towed to another city. They were going to have to stay behind and wait another day. You know how that sets with a Mom. I was thankful that the car didn't break down somewhere with those darling little divas and a puppy in 105+ heat. And thankful my daughter and her family stayed behind with them one more night. Please don't take me wrong I did praise God while I was there for His beautiful creation and the blessing to be able to come one more time with my family...I did worship Him and praise Him! When it was time to leave we did our hugs goodbye, yet at the time, I was somewhat anxious to leave them all behind and then it hit me. The glimpses of God's glory that I had been looking for all week was in the faces of each one of my kids that day. I wasn't expecting this....I fought tears all the way out of town. I had asked and asked for 4 days for a glimpse of His glory...and once again He was faithful. I was wowed and I knew, that I knew, this was the glimpse God wanted me to see. That's what I saw one day last week..glimpses of His Glory through my family! Pretty cool stuff. I know, I know, I know that I know ... what you were feeling. Bless you for putting it into words, dear friend. Bless you for sharing your heart, for being *real* and for encouraging all your readers with what the Lord imparts to you. This really touched my heart Patty! Well that was a post to bring tears to ones eyes. What beautiful photos of the ocean. And what beautiful thoughts about where we see God's glory..in those we love. May others always see God's glory in us too. It certainly comes through you with what you share here. What a beautiful post. Glimpses of God's glory in the faces of your beautiful family, that is indeed a precious thing. I am on a little break but had to come by and say hello and knew something wonderful would be waiting. Thank you so much for such a beautiful place to visit. You and your family enjoy a beautiful week. Thank you all for your encouragement...Blessings to you!